I’m emerging from a fog of overwork just in time for Christmas. To celebrate my free day yesterday, we went to the Brisbane art galleries. The two exhibitions that we saw were wonderful. But finding our way around proved to be more of a challenge … even though we’ve been to both galleries several times over the years. It was the signage to find the cafe and toilets that caused us trouble. After seeing the first exhibition, in the Gallery of Modern Art, we decided that lunch would be a good idea. The signs told us that there were two cafes – one on Level 1 and another on Level 2. But the signs on Level 1 failed to inform us that there is no exit on that level, so we were unable to get from the gallery to the outdoor cafe. We weren’t the only family to be looking quizzically at the signs and wandering aimlessly around the corridors! We knew that the cafe was close, but we had no idea how to get to it. On Level 2, we found a (closed) restaurant, but no cafe. Thankfully we did find the main exit, which allowed us to make our way to the riverfront and to the cafe. Of course, there were no signs to give us confidence that we were going in the right direction. After lunch we made our way to the Queensland Art Gallery for the second exhibition – via a toilet stop. Finding the men’s toilets was easy (a clear, standard sign on the door). But no women’s! We eventually asked for help, and were told that the women’s toilets were behind the other door. 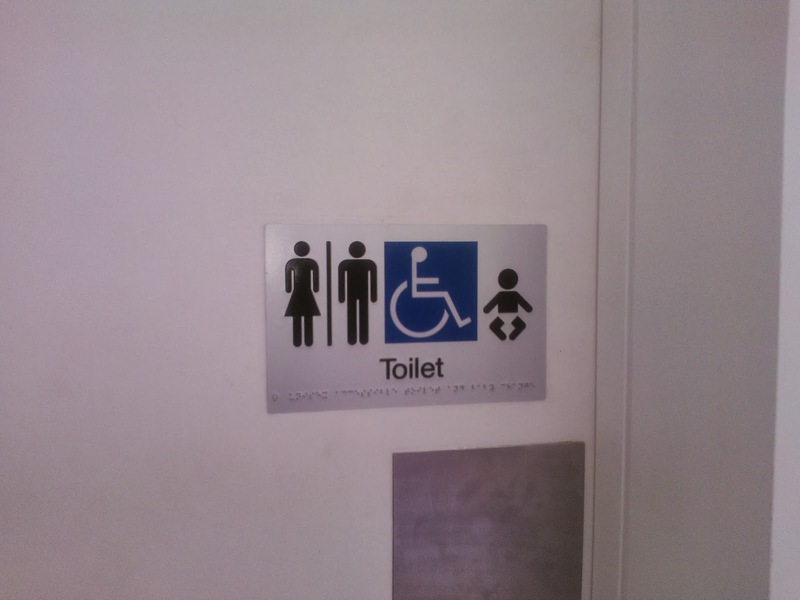 The sign is meant to indicate that the door leads to both the women’s toilets and the disabled toilets. I didn’t understand that from the picture! I wonder how many other people get confused.